I’m an insect get me out of here! Well done to Toff for being crowned Queen of the jungle! Now you can get a bit of the action with your own bush tucker trial at home with this latest trend. Grubs, worms and insects come in a variety of delectable ways to eat – snack packs or bars, pasta, flour, crackers or buffalo worms with a sprinkling of spicy chilli. Insects can be good for you, they contain more protein than chicken, two times more iron than spinach and are good for the environment. I tasted them first in Mexico 7 years ago, where I had deep fried crickets with guacamole, which had a moreish crunchy texture. This trend will be coming to your table at home soon, with its strong environmental credentials and nutritional source, we need to join the other two billion people world wide who eat insects regularly. What does it taste like? Cricke do a range of products using crickets, I like the crackers, they have an oat cake type taste and texture. Eat Grubs flavour their crickets with Peri-Peri or Smoky BBQ for a crunchy snack and they’ve also made them into bars with blueberry & almond flavour and orange & red berries and taste quite like a cereal bar. Jimini’s have flavoured crickets, buffalo worms, mealworms and grasshoppers in snack packs, they also have bars and pasta. The spicy chilli buffalo worms I had last night would be a great addition to a salad. Where can I buy it? Cricke crackers are available from their online shop, hopefully their bread, flour and pasta will be on sale soon. Eat Grub products can be brought at their on line store or Yumbles for the snack bars. 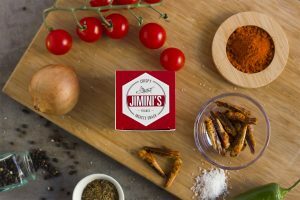 Jimini’s pasta and snacks can we picked up via their online store and also at Amazon. Any recipe suggestions? Insect pasta is full of protein so I have used a classic vegetable pasta sauce from Nigella Lawson. Try Nigella’s pasta with courgettes from Nigellissima with Jimini’s ground buffalo worm basil fusilli. It has the texture of wholemeal pasta and is hard to distinguish in taste from regular pasta. Where can I eat it? For a taste of the exotic try Archipelago restaurant in Fitzrovia, they have pan-fried chermoula crickets with quinoa, spinach and dried fruit and for dessert, caramel mealworms with bilinis, coconut cream and vodka jelly. Environmental –insects release 99% fewer greenhouse gases compared to cows. They also require less space, water and food than cows, pigs or chickens to grow and will become more important as a protein source as the world’s population expands. Nutritional facts – insects contain vitamins B1, B2, B12 and Omegas 3 & 6 and 63g of protein per 100g. They contain more iron and calcium than chicken, beef or pork. Author ClairePosted on December 12, 2017 January 11, 2018 Tags bugs, cricketpasta, crickets, food blog, food trends, imacelebrity, insects, marcuswaring, nextonyourtable, nigellalawson, recipe, recipesLeave a comment on I’m an insect get me out of here!